We pried our hands from the keys to our suite in Saugatuck and headed out this morning after breakfast. We weren’t entirely sure where we were going, but we knew we didn’t want to head straight home. We don’t get to the west side of the state very much and wanted to take advantage of the sunny (yet cool) day we had. South Haven wasn’t very far from Saugatuck so we drove there to check out yet another yarn shop which turned out not to be open until later that day and Shannon didn’t want to take the time to wait. While we were there we swung by the beach and lighthouse. Surprisingly there were several others there bundling up that planned on walking out to the beach to see the tiny red lighthouse. With the blustery winds near the water, Shannon and I decided to sit this one out. Before you say we’re wimpy, keep reading. On a side note, there was a great deal of work being done near the pier and beach area. From the looks of it, it’s going to be very nice when completed. From South Haven, it was just a short jaunt to St. Joseph and there we struck proverbial gold! Before we even headed into town, we stopped off at the North Pier to see the lighthouses. The sun came out in full force and Shannon and I couldn’t resist taking a walk up the frozen sand dunes to snap off a few shots of the lighthouse. Once we headed out, despite the snow and the wind, the sunshine made our walk far more tolerable. We were rewarded with some great pics. We slipped our way across the ice that leads out to the lighthouse, but at one point it was way too slippery to head out any further. 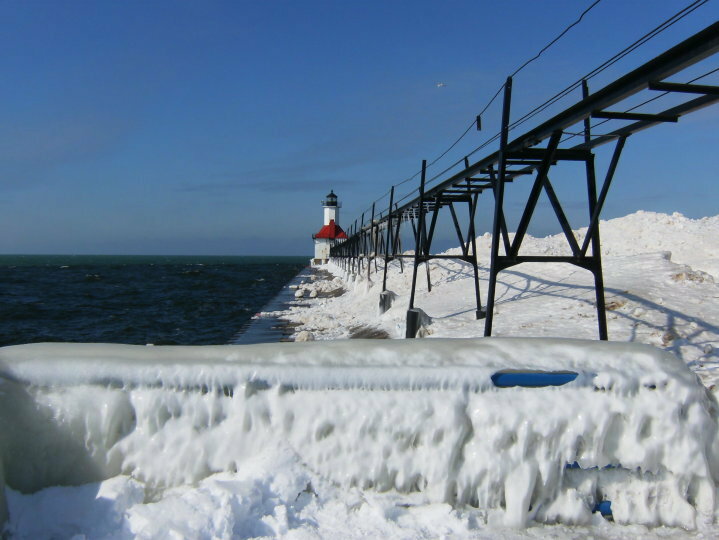 At times the waves crashed up on the pier and even along the snow/sand mounds. As you can see the ice coated the railings which made it virtually impossible to tread out any further to get a closer look at the light. From the pier we headed into town and we had no idea the 6th Annual Magical Ice Carving Festival was underway. We spent about an hour our so being fascinated by the craftsmen/women who were hard at work shaping blocks of ice into creatures ranging from a dragon fly, to dragons. They even had a putt-putt course constructed of ice sculptures for kids to play. It was such a beautiful day and such a beautiful setting. This was certainly a fitting way to end our weekend getaway. What made it even ‘cooler’ was it was unplanned and unexpected. You would have thought we knew what we were doing! It turned out to not only be a wonderful 20th Anniversary, but a very Happy Valentine’s Day! I had a wonderful time with my sweet bride on this weekend getaway. It’s difficult to believe we have been together for 20 years. She officially has been living with me longer than she had with her parents. See our children grow so quickly, and seeing how much God has blessed us is truly humbling and gratifying. It truly has been only by God’s Divine Grace and Favor that we have enjoyed the life we have. Keeping God first has been and will always be the key to longevity in a marriage. When God is first in both of your lives He gives you the center, and from there, despite life’s challenges, God grants you His Grace to see them through. Our evening was winding down nicely. We drove through downtown Saugatuck and amidst the flurries and increased weekend traffic the little town was awakening ever so slightly. Shannon wanted to visit a few of the clothing shops, most of which had a 50% off sale trying to clear out the winter merchandise. But, even at 50% off some of the items this exclusive town is known for were still priced beyond our modest budget. Definitely not a town to shop for bargains. She was able to get a deal on some bags and some slippers. From there we headed to what we had hoped would be a relaxing dinner at The Butler. Everything was enjoyable – the fireside, the view of the bay, the ambiance, and even the clam chowder soup was delicious. I ordered pan-fried walleye, and Shan ordered Crab Mushroom Chicken. My entree was excellent with a side of the Butler fries. Shannon’s entree on the other hand arrived pink in the center, which of course is not good for chicken. She returned the entree to the kitchen to cook it further. When it arrived the second time, it was only slightly better. She picked at it and we left feeling a bit cheated by the whole experience. The bill was roughly $40. I wouldn’t recommend this restaurant to anyone unless they order something like the Butler Burger for which they’re known. Our server Patti was very delightful, but very over extended due to the proximity off the tables in our section being so far from the kitchen. We may try the restaurant again, but will certainly avoid the chicken entrees. After dinner we drove all through Douglas and the outskirts of Saugatuck doing some sightseeing and getting a lay of the land. On our way back into Saugatuck for the night, we snapped the above picture at the Lake Street entrance to Saugatuck. While Shannon shopped at Lizzie Ann’s, I strolled over to a local coffee house called JP’s Coffee and Espresso Bar. Based on Shan’s review of Lizzie Ann’s, it appears my trip to JP’s was much more…delightsome shall we say. As I stepped in the place was hopping, even at 3:00 p.m. There were wall-to-wall coffee drinkers, wi-fi scrounges, and baristas everywhere. A very hip and happenin’ place. A very energetic vibe, the kind you’d expect at a successful coffee house. Nothing like the lethargic generics at Starbucks! The baristas were all chatty and helpful. My Vanilla Latte was the best I’ve had in a long time. While I waited for my drink, there was a video playing of a barista competition where they were literally making art out of th e foam and froth atop the various lattes. There were leafy floral patterns, hearts, and swirls of all types. I was fascinated as the barista, like an artist would carefully and cleverly pour the froth, swirl, and voila! A masterpiece in your mug so fantastic one would hesitate to drink it. Surely a snap shot taken by your camera phone, uploaded to Facebook, Twitter, and Flikr would be in order before the sip! We started our day off with a small breakfast as provided by Bayside Inn. It was comprised of a variey homemade coffee cake, banana bread, a variety of fruit, cereals, and a breakfast quiche. I broke in my antique coffee pot with some coffee I bought the other day from Uncommon Grounds Roasters here in Saugatuck. 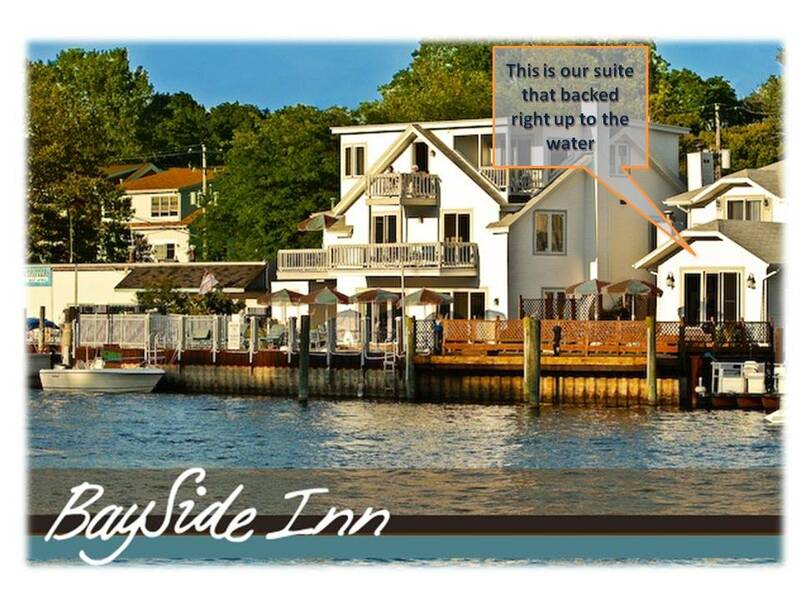 I would certainly not stay at Bayside Inn for the breakfast. After breakfast I spent sometime catching up on my blog and Shannon spent time knitting, and re-knitting a shrug she’s making for her sister. I know, not much of an adventure, but when you’re used to going all the time, doing leisurely things like this are a luxury. I’ve kept up with some of my emails, Facebook, Twitter, etc. but being away physically has been just what we’ve needed to re-spark, refresh, and rejuvenate. The wasn’t a total wash however, because during our relaxation time a drama on the river outside our suite began to unfold. 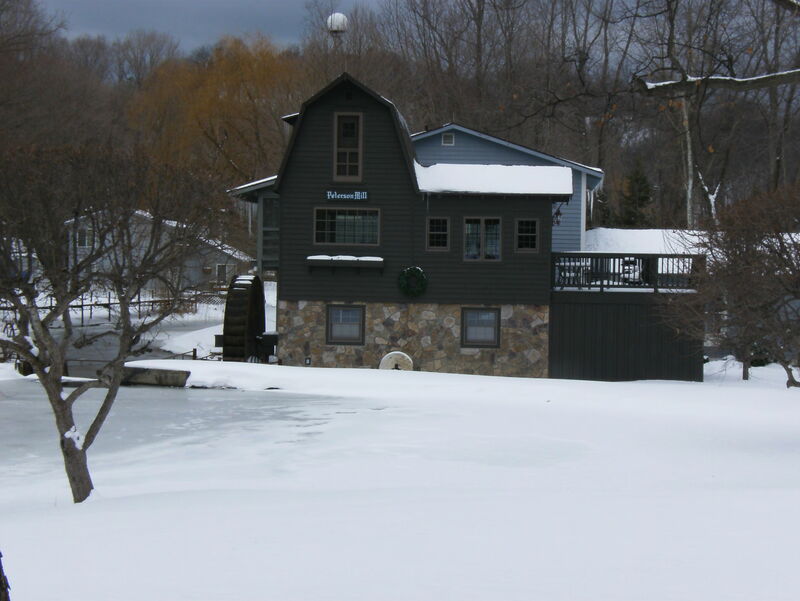 To our delight and amazement, a couple of ice-cutters were docked just next door to our inn. 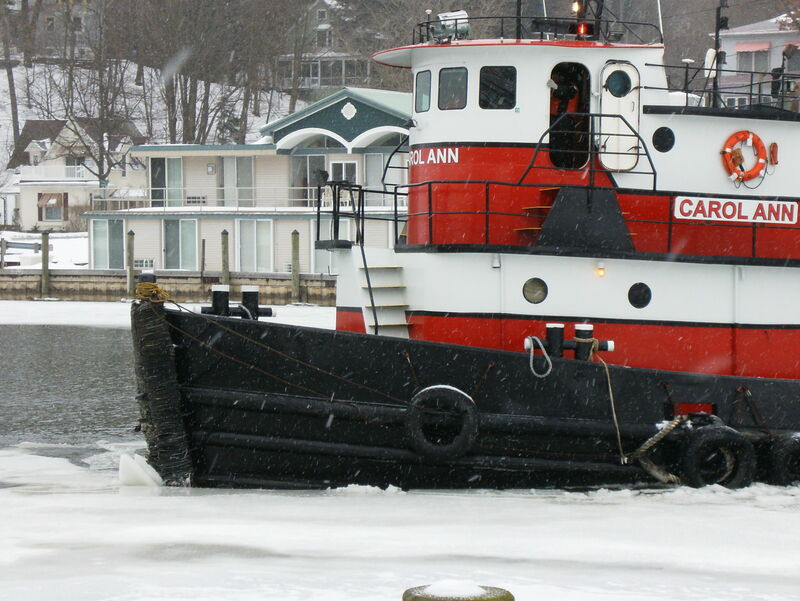 The Carol Ann (Holland, MI) began cutting through the ice flows like butter until she reached a fairly large flow that required several full-steam stabs to get it to break. Below is a video account of one of the stabs. Honestly, I can’t think of a cooler (no pun intended) way to spend the morning than watching these guys trudge head long into huge ice flows. Even Shannon was having a blast watching the drama unfold. This may be a common occurance here in Saugatuck, but for us it was a real treat. After our marathon day, it was nice to settle into our cozy and comfortable room at the Bayside Inn of Saugatuck. For a detail of the layout of our suite click the LINK. This suite is also a bed and breakfast. We got an extremely competitive rate on the room due to the season. Granted, there wasn’t much going on around Saugatuck, Douglas, and even Holland, but that’s part of the reason we came up here. There was just enough stores and restaurants open to make it a relaxing weekend. Our Suite (No. 9) was huge being more long than wide roughly 16′ x 40′. Overall the decor was fairly modern, but the kitchen was dates as was the bathroom. The bedroom was on the small side, but the large living, sitting, and dining area more than made up for the lack of bedroom size. Cleanliness was decent. We weren’t thrilled about finding a baby’s diaper in the bathroom trash. Fortunately, it was just a wet diaper. The linens were clean, but could have been more generous in the quantity. The kitchen was clean, but the cupboards were a bit dated. There was not a dishwasher or garbage disposal, but it did include a full-sized fridge and microwave. There was a hair dryer, ironing board w/iron, a 27″ flat screen TV with DVD and cable, and the best part, a gas fireplace that added warmth and ambiance. The big question? Would we ever stay here again – A resounding YES! Our particular suite was great for a couple, but a family would have a difficult time managing with one bathroom, one bedroom, no dishwasher, etc. While the couch does fold out to a queen size bed making it possible for a small family to stay here, I’d still spring for a 2-room suite for the overall enjoyment of everyone…especially Mom and Dad!